Based In Nantwich we also service Tarporley, Sandbach, Chester and Surrounding Areas. 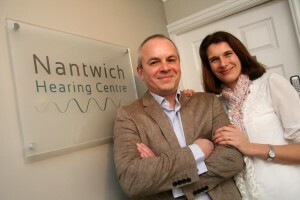 Nantwich Hearing Centre opened its doors to the public in April of 2015. The centre is owned and managed by Alan and Helen Jackson, who live in Nantwich with their young family. Alan is a qualified hearing aid audiologist, authorised to practice by the Health and Care Professions Council. He was working for a well-known national hearing company, managing a busy clinic in Nottingham, when he first started thinking about opening his own hearing centre closer to home. These early ideas quickly developed into a clear plan to open and operate the best independent hearing centre in Cheshire. Purpose built hearing centres are predominantly owned by national companies and these companies in turn are owned by the large hearing aid manufacturers. These centres are therefore set up to sell the parent companies’ products rather than offering choice across the full range of manufacturers and providing the most suitable hearing aid for the individual patient. Hearing Services in the independent sector tend to operate out of unrelated businesses such as opticians or well- being centres. Hearing services are an add-on to the core business and in many circumstances audiologists are only available 1 or 2 days per week. In some cases Hearing aid dispensers are mobile and operate entirely out of customers’ homes. The primary aim of these companies is to sell hearing aids not to offer hearing health care. Very few of the above offer the latest testing and fitting equipment. The situation described above appeared to conflict with the expectations Alan’s many patients seemed to have of their Audiologist and the ongoing support they required with their hearing health. Alan became convinced that a centre dedicated to all aspects of hearing health, providing a full range of services to the local community, 5 days per week, would be the most effective way of meeting these expectations and the only way to provide the level of hearing care required. This became the basis for Nantwich Hearing Centre. The best hearing protection products, e.g. Cen’s gun ear protection, custom noise protection, custom made swimmers ear plugs and sleep plugs. The very latest hearing aid technology e.g. made for iPhone wireless hearing aids. The very best standard of after-care. Totally independent and we only recommend the most appropriate hearing aids for the patient in order to achieve the best possible outcomes. Equipped with the very latest testing and fitting equipment available on the market. With a very clear plan in place, the next challenge was to find the right location. A number of towns in Cheshire were considered before suitable premises were found in Nantwich. Nantwich is a beautiful, thriving market town and easily accessible from a number of surrounding towns including Sandbach, Audlem, Congleton, Tarporley, Whitchurch, Market Drayton and Shrewsbury, none of which have an independent hearing centre. The nearest business offering the full range of services; free hearing tests, wax removal and access to the very latest technology, is located in Chester, 25 miles away. A hearing centre in Nantwich would also be accessible for residents in smaller villages such as Audley, Alsager, Bunbury, Clotton, Eaton, Huxley and Tiverton. Once the lease was agreed on the premises Alan began the work to equip the centre to the very highest standard. A purpose built, wheelchair accessible, hearing booth was built in the testing room and the very best equipment sourced from America. Nantwich Hearing Centre has positive relationships with all the major manufacturers, who fully respect our independence and our commitment to only provide our patients with the best hearing system for their needs. Starkey, Widex, GN Resound and Oticon all work with us to provide specialist ongoing training to ensure that our patients always receive the very latest technical expertise and support. As we approach the end of our first year in business we are satisfied that we are achieving the objectives we set. We have many patients who live in Nantwich itself who are very happy that they do not have to travel for hearing aids & private audiology services. Over the last 6 months people are finding us from further afield and we now have patients who visit us regularly from Sandbach, Audlem, Holmes Chapel, Tarporley and Alsager. We continue to focus on what we do best; providing the very latest hearing technology and the very best standards of patient care. We look forward to looking after the hearing health of the residents of South Cheshire for many years to come.